The wit, warmth, and humor embedded in Samuel Porter Ballard’s poetry suggest that he probably savored the title even though he earned other life labels and historical identifications as a Sojourner Truth Abolitionist, Ernie Pyle journalist, Carrie Nation temperance man, Lincolnesque learner, and bedrock member of the Grange and State Historical Association. Against his backdrop of his time and place in history, Samuel Porter Ballard can be interpreted as a Midwestern extension of the New England Fireside poets, and a living example of the Harmonium Philosophy that he and his wife Huldah Ann Phelps Ballard practiced all of their lives. Along with Hoosier poet James Whitcomb Riley, Samuel Porter Ballard often expressed his theology without really identifying it by name in his poetry. According to one James Whitcomb Riley perspective, James Whitcomb Riley was the “Hoosier Poet,” with and enhanced definition-just as Samuel Porter Ballard was the “Bard of Willis” with an enhanced definition. In the world of expanded poetic horizons, the name Hoosier covers more than people from Indiana. It applies to people who are humble, hardworking, empathetic to other people, and tolerant of others outside their race, creed, gender, or social status. This perspective adds a religious element to Hoosier by stating that Hoosiers walk humbly before God and reflects a kenotic outlook, striving to erase their own wills and completely embracing what they perceive as God’s divine will. The effort to dictate what blast you shall blow. And crow your own crow. Just answer him promptly, you crowed your own crow. To crow their own crow. James Whitcomb Riley made an important contributions to the American poetry conversation by adding a distinctly Midwestern voice and cultural identity, almost to the point of a creating a Midwestern caricature. Not surprisingly, since he was born in New York and his wife Huldah Ann Phelps Ballard greeted the world in Massachusetts, the poems of Samuel Porter Ballard also reflect the influence of many of the techniques and themes of a group of New England poets that literary scholars have named The Fireside, Household, or Schoolroom Poets. The 19th century Fireside Poets who are traditionally considered to be Henry Wadsworth Longfellow; William Cullen Bryant; John Greenleaf Whittier; James Russell Lowell; and Oliver Wendell Holmes, Sr,. popularized poetry to create an American challenge to British poets including Tennyson. They created a brand of poetry patterned after technical conventions including regular meter and rhymed stanzas that were easy for students to memorize and recite at school and enjoy with their families by the fireside at home. The Fireside Poets wrote poems about domestic life, mythology, and American politics, subjects that appealed to ordinary people. They had strong religious and political beliefs and several were Abolitionists. Samuel Porter Ballard who contributed his distinctly Midwestern voice in both poetry and prose was reportedly an ardent Abolitionist himself, in the tradition of his New York and New England ancestors. The son of Asa N. Ballard, a native of Massachusetts and Elizabeth Henry Ballard, born in New York, Samuel P. Ballard was born in Monroe County, New York on January 20. 1824. Samuel’s grandfather on his father’s side of the family fought in the Revolutionary War. Asa and Elizabeth Ballard’s children were: Forbes H.; Celinda who married James Pierson; William; Florilla Polly Russell; Rachael; David; and Samuel. The early history of The Library of Michigan and several of the pioneer volumes on its shelves record segments of the boyhood world of Samuel Porter Ballard, also known as S.P. Ballard or Porter Ballard. In 1805. Michigan became a territory and paralleling other future states in the Northwest Territory, early Michigan settlers embraced the goal of becoming a state through population growth. The opening of the Erie Canal in 1825 increased the numbers of settlers coming to Michigan from ripples to waves. Between the 1830s and 1840s, mostly New Englanders and upstate New Yorkers had swelled the population from 29,000 in 1830 to 212,000 in 1840. Asa Ballard and his family were among these pioneers who followed the progression of “Michigan Fever” to Michigan. The Wednesday August 11, 1841 issue of The Signal of Liberty featured an article offering relief to people who suffered from fever and ague, chills and fever, and diseases from marshy communities and unhealthy climates. Stephen B. Luther, Jr. believed he had discovered a cure for these pioneer maladies. He wrote that one dose of the Persian pills once and in some cases, maybe twice a week would “cleanse the system and purify it from the small accumulation effluvia, which causes the different diseases….” Mr. Luther Jr. recommended that sufferers take six or eight pills before bedtime and gradually decrease the number as they felt better. Another advertisement in The Signal of Liberty of Saturday, October 3, 1846, offered a definitive cure for Fever and Ague. Ol FEVER AND AGUE finally conquered! This disease at length met with an opponent, before which it had to yield, prepared by Charles Osgood, M.M. This gentleman resided several years in an infected district of Michigan, making Fever and Ague, its cause, effect, and cure, his study, and from the knowledge thus acquired, he compounded the above named medicine, which has not yet been known to fail. Numerous certificates from men of the highest respectability, testifying to the great efficacy of his medicine, can be seen on application to the undersigned. MAYNARD S. Agent for the proprietor. Samuel Porter Ballard, “The Bard of Willis”, was still chronicling the prevalence of diseases in his Willis and other community columns in the Ann Arbor Argus of early January and February 1889. Many who’re under the ground. Female diseases so terrible in their effects and so prevalent among all classes can be cured by the use of Dr. Pierce’s Favorite Prescriptions." On February 1, 1889, The Bard of Willis wrote that “scarlet fever, diphtheria, and measles are having a general boom around this part of the country.” He also wrote that the general greeting now days when people meet is, “Have you been vaccinated? Has your arm worked? Look out there, that’s my arm! Some of the people are trying to figure out which is the worst to have – the small pox or to be scared to death by hearing the reports that have been in circulation." Diseases like measles, diphtheria, scarlet fever and typhoid fever stalked and ended the lives of many pioneer children and killed adults as well, creating the patent medicine and pill and potion miracle cure offerings in the classified sections of the newspapers of the day. Travel made inroads into sparse pioneer funds. The pioneer laborer made on the average of fifty cents a day and if he or she had to travel paid about 25 cents for a bed and 25 cents for a meal. It took from five to eight days to travel by stagecoach from Detroit to Chicago, and weeks to travel from the beginning of the Erie Canal in Albany to Buffalo and then on to Detroit. Once they arrived on their land, pioneers like Asa Ballard and his family had to start building their lives with the first stroke of an axe instead of a servant holding the front door wide in welcome. Along with their determination to conquer the Michigan wilderness, these mostly New England pioneers brought their desire to learn, honoring and employing schoolmasters and establishing private academies and later state universities. During Samuel’s boyhood days wolves howled and gathered near the Ballard cabin... As well as wolves, he and his family frequently encountered bear, deer, and other wild life. He learned to use a rifle ad shoot wild turkeys and although he fished the streams, all of the fish that he caught didn’t diminish the number still swimming in the network of streams and creeks running through the township. Samuel frequently observed Indians in their everyday lives and watched them perform their war dances. Pioneering a farmstead consumed much of the Ballard’s time, but like Abraham Lincoln, Samuel Ballard’s desire for knowledge impelled him to read by the light of the hickory fire through long winter evenings. As newspapers became more common in Michigan Territory, Samuel read them eagerly and thoroughly to keep abreast of current events and issues. Six days after Samuel Ballard celebrated his thirteenth birthday on January 20, 1837, President Andrew Jackson signed a bill on January 26, 1837, naming Michigan as the 26th state in the United States. Michigan also acquired additional land called the Upper Peninsula, making it the state with the most Great Lakes shoreline. Over the next nine years Samuel Ballard continued to farm, clearing an eighty acre farm in Ypsilanti Township as well as performing other pioneer work. He saw his father Asa buried in 1844 and would lay his mother Elizabeth to rest in 1861. He helped transform Washtenaw County from an uncharted wilderness to a productive agriculture center, and he married Huldah Ann Phelps. Like her husband Samuel Porter Ballard, Huldah Ann Phelps came to Michigan with her parents as a young child. A daughter of Norman and Huldah Miranda Harvey Phelps, she was born on October 17, 1826 in Massachusetts. The Phelps family came to Michigan in 1836 when Huldah Ann was just ten years old. Huldah Miranda Phelps was born in 1799 and died on January 11 1879. The 1850 Federal Census shows that Norman Phelps was born in Massachusetts about 1801 and in 1850 his family at home consisted of Norman, 49; his wife, Huldah, 56, his son Seymour 22, and his daughter Josephine, 4. Their daughter, Huldah Ann Phelps, had already left home to marry Samuel Porter Ballard on February 10, 1846. The 1850 United States Federal Census shows Samuel Porter Ballard, 26, and his wife Huldah, 24 living in Ypsilanti with their newborn son, Norman. The 1860 United States Federal Census shows Samuel P. Ballard, 36, living in Ypsilanti with his wife Huldah A., 34, and their son Norman Asa, 10. Samuel’s brother Forbes Ballard and his family lived nearby. Norman Asa Ballard – the Ballard’s son and only child, was born on September 2, 1849 and named for his Grandfathers Norman Phelps and Asa Ballard. Norman Asa Ballard died on October 6, 1866 at age 17. Norman’s Uncle Forbes H. on his father’s side and his wife Mary Celina named a son born in 1868, Norman Asa Ballard after Huldah and Samuel’s Norman Asa. Besides devoting himself to his family and farm, Samuel Porter Ballard found time to develop his writing and wit and contribute to his community. In 1863, he joined the Grange Society, serving the organization in various roles. 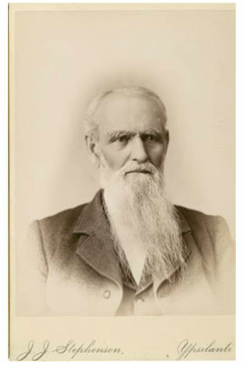 For several years he served as Treasurer of Pomona Grange at Ypsilanti and when he moved to Augusta Township in 1863, he joined Grange No. 52 and served as Master of the Fraternity and secretary and lecturer. He also was a long time member of the Masonic Order. Politically he belonged to the Prohibition Party, but he educated himself about the leading issues of the day and discussed them knowledgeably. Over several years of writing for several local papers, he honed his talent for writing poems known for delicacy, strength, and wit. He wrote poetic prose with the same characteristics. Her biography in the Portrait and Biographical Album of Washtenaw County, Michigan; 1891, stated that Huldah Ann Phelps Ballard had a “large and varied mental ability,” that complimented her talented husband. She presented public lectures on various aspects of Harmonial Philosophy, a form of Spiritualism spreading through 19th century America. Harmonial Philosophy focuses on the quality of love a person brings to seeking of truth, justice, and wisdom and advancing humanity in wisdom, virtue, and happiness, ultimately uniting the human soul into harmony with God and Nature. Huldah Ann Ballard and her husband Samuel spent their lives living this philosophy, with Huldah earning a statewide reputation with her lectures, as well as being called to preach funeral sermons and console bereaved families. Ironically, she would suffer the devastation of the death of her only son Norman Asa Ballard, who died at age 17 on October 6, 1866. There is no record of Huldah Ballard preaching her son Norman Asa’s funeral sermon, but historical imagination views her standing at his grave reaffirming the immortality of God and the human soul according to her Harmonial Philosophy and comforting his father and other mourners. His obituary printed in the Marshall Evening Chronicle of Saturday, July 20, 1912, credits Samul Porter Ballard with being connected with the Underground Railroad. After the Civil War many people claimed to have been involved with the Underground Railroad as a sometimes unearned badge of honor, but Samuel Ballard lived in the right time, right place, and possessed the right temperament to use his farm as an Underground Railroad station. Ann Arbor earned a symbolic Grand Central Station category terminal because Editor Guy Beckley produced a weekly Antislavery newspaper called The Signal of Liberty, one of several Michigan Anti-Slavery newspapers, from his office on Broadway. The city became an important starting point and destination stop for fugitive slaves on their way to Canada and freedom. In the Monday, September 25, 1843 issue of The Signal of Liberty, Editor Beckley printed a Detroit Advertiser summary of the nature of Abolitionists which predicted an impending change. The Detroit Advertiser said that there seemed to be two classes of Abolitionists, with distinctive views and operating methods. The Old Abolitionists embraced the first principles of Abolitionism, striving to spread antislavery principles and channel public opinion to antislavery beliefs with discussion and argument. The National Antislavery Standard published in New York and edited by David L. Child, originated this brand of Abolitionism. “Few men are better acquainted with the political history of our country, and the leading characters in past times, than its editor,” The Detroit Advertiser summarized. Like the Abolitionist movement that the Detroit Advertiser analyzed, the City of Detroit itself had a varied and changing history of dealing with slavery. Slavery existed in Detroit and surrounding regions in the 17th and early 18th centuries, with prominent citizens like William Macomb and Judge James May and more ordinary people like John Askin owning and selling slaves. As an ironic counterpoint, Detroit became one of the most important destinations on the Underground Railroad because the Detroit River and its proximity to Canada. Samuel Porter Ballard’s obituary in the Marshall Evening Chronicle listed “ardent temperance man”, as part of his life work and accomplishments, a philosophy that he lived as well as preached. It is easy to image him sitting in front of the fire engrossed in a copy of the Signal of Liberty, which also advocated Temperance and Women’s Rights along with Antislavery and the Liberty Party. In fact, The Signal of Liberty reported what it deemed “the first mass Temperance meeting in the state” in its Wednesday, August 11, 1841 issue. The “Temperance jubilee” took place on August 3, 1841 in Ypsilanti. The Signal of Liberty editors boarded the railroad cars in Ann Arbor along with 600 Temperance enthusiasts and traveled to Ypsilanti where a large delegation of local citizens and people from Detroit greeted them. The people formed a procession and with several bands marching in front along with Major C. Rollo, Marshall of the day, everyone marched to a grove on the banks of the Huron River. Even though he didn’t write these two lines of poetry, Samuel Porter Ballard, Temperance man, would have firmly agreed with them. Samuel Ballard purchased his farm in Augusta Township in 1862, and the family moved onto it in 1863. The farm was only forty acres, but he kept it in perfect order. The Ballards lived in a farmhouse fitted with modern conveniences, and beautifully furnished, reflecting the refined tastes of the couple and projecting culture and refinement rarely found in rural farmhouses. Both were highly esteemed and respected members of their community, and their many friends wished them years of enjoyment of the good things of life. They were known far and wide for their extended hospitality which they freely and lavishly shared. Not content to just tend his farm in Augusta Township, Samuel turned his attention to the community and served in varying positions and several capacities in local offices, including Commissioner of Highways for six years; and Justice of the peace for four years. Founded in 1867, The National Grange of the Order of Patrons of Husbandry, is a fraternal organization encouraging families to unite to promote the economic and political health of the community and agriculture. It is the oldest American agricultural advocacy group with a national scope, with major accomplishments including passing the Granger Laws regulating railroad fares and grain elevator prices and creating rural free mail delivery. The son and grandson of farmers and a lifelong dedicated farmer himself, Samuel Porter Ballard became an early Granger. He served as Treasurer of Pomona Grange in Ypsilanti before he moved to August Township in 1863 and joined Grange No. 52. For many years he served as Master of the Fraternity, Secretary and Lecturer of Grange 52. He acquired a statewide reputation for writing articles highlighting the advantages of Grange societies. In an article in The Grange Visitor of August 1, 1884, Samuel Porter Ballard wrote about the July Fourth Celebration in Augusta, noting that the children were out in force seated at the table and they looked like the future Grange gatherings. After dinner, the Grangers enjoyed music, recitations, and impromptu speeches about the future of America. An earlier issue of The Grange Visitor, dated November 1, 1883, contained a poem that Samuel Porter Ballard had written, designed to make both members and officials reflect on the meaning and past, present, and future of the Grange Movement. Worthy Lecturer, what of the Grange? All the lessons of the past? That no cloud has overcast. Mid the fleeting things of earth. Are your helpers wise and good? Are the brotherhoods as one? Does our cause move grandly on? Light our passage down life’s stream? Are we making life sublime? At your leisure, answer me. The sleeping journalist and poet in Samuel Porter Ballard woke up with a shout and jumped feet first into the nineteenth century newspaper world. For the most part, newspaper editors before the Civil War started their careers as printers, using the newspaper as a way to keep their press running between printing jobs. They usually published whatever available material they had to fill their newspaper, including stories from other newspapers, political items, and local news and gossip. The local news sections gave the newspaper a distinct identity and offered a platform and opportunity for ordinary people and aspiring journalists and writers to express themselves. Although he didn’t have much formal education, Samuel Ballard thrived on reading and acquiring knowledge and besides farming and his family, he loved people. Since he had lived in Washtenaw County since boyhood and farmed its land, he knew the area and its people well. This knowledge combined with his wit and writing talent made him an effective reporter. Many newspapers of his time routinely printed poetry, so Samuel Ballard developed his talent for poetry and used it to enhance his reporting. The Bard of Willis returned the writing volleys. A week later, the Ann Arbor Argus of May 21, 1897, printed “An Attempt to Get Even,” regarding the Bard of Willis. This is the way in which “the Bard of Willis” gets back at Seward Cramer of the Times, in last week’s Ypsilantian for some of the digs that gentleman has given him. “We understand that Mr. C of the Washtenaw Evening Times has taken out a life insurance policy on the inhabitants of a limburger cheese. Should the death rate create a panic commensurate with his increasing love of the beautiful, he will undoubtedly consecrate the emotion in his mind’s eye to the mistress of his unmated expectations of what he sings. Hear him! Seward after that rap, you had better keep still! As Samuel Porter Ballard wrote – not entirely tongue-in-cheek - in his poems to Mr. C of the Washtenaw Evening Times, most people dream of a home in the bright evermore, kept by a “sweet little fairy.” His wife Huldah had filled the role of his sweet little fairy for more than sixty years after their marriage in February 1846. He didn’t indulge in lengthy print obituaries, but the light in his life dimmed when Huldah died on December 27, 1909. The 1910 United States census shows Samuel living with his nephew William E. Ballard and William’s wife Cora in Augusta Township. Two years later, the Marshall Evening Chronicle printed Samuel Porter Ballard’s obituary. Ypsilanti, Mich. July 20, Samuel Porter Ballard, famous throughout the state as the “Bard of Willis” and for many years the writer of quaint philosophy and entertaining verse for the local papers, most of them widely copied, is dead at the home of George Freeman near Belleville- age 88-July 16, 1912. He was an early Abolitionist, an ardent temperance man and prominent in the Grange and State Historical Association. The funeral was at Belleville today. Mr. Ballard was for forty years the “Willis correspondent” for various Ypsilanti newspapers and his ability in verse and his wonderful descriptions of local banquets and other events made him famous all over the state. Many of his efforts being extensively coped by Detroit papers. Some of his last poems, notably “The American Farmer” and “Crow Your Own Crow” had a national circulation. Mr. Ballard was connected with the Underground Railroad by which many slaves escaped to freedom in Canada before the war. He was a Mason of many years standing and had been prominent in local, county, and state Grange work and pioneer societies. Recently his wife, to whom he had been lover as well as husband for sixty four years, died. Mr. Ballard was born in Parma, Monroe County, New York, but lived in this county since 1827. Samuel Porter Ballard is buried in Union –Udell Cemetery in Ypsilanti, resting with his wife, son, and friends, including Uncle Daniel Pierce. Asa Nurse Ballard. Michigan Land Office Records. ; William Ballard, circa 1808; born in New Salem, Franklin, Massachusetts. Son of Asa Ballard and Elizabeth Ballard, brother of Florilla Polly Russell; Forbes Ballard; Rachel Ballard; Celinda Ballard; Samuel Porter Ballard. Ann Arbor Argus. Willis. February 1, 1889. Spiritualism in Antebellum America. Bret E. Carroll. Bloomington, Indiana: Indiana University Press, 1997. Beyond the Northeast Corner: A Brief History of Freemasonry in Michigan. Early Michigan masonry. Chapter 3, Richard H. Sands.